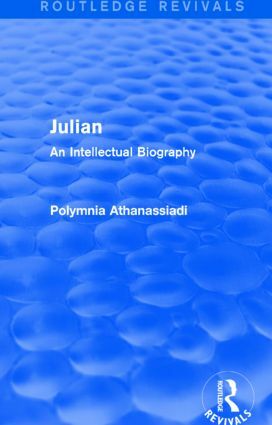 Julian: An Intellectual Biography, first published in 1981, presents a penetrating and scholarly analysis of Julian’s intellectual development against the background of philosophy and religion in the late Roman Empire. Professor Polymnia Athanassiadi tells the story of Julian’s transformation from a reclusive and scholarly adolescent into a capable general and an audacious social reformer. However, his character was fraught with a great many contradictions, tensions and inconsistencies: he could be sensitive and intelligent, but also uncontrollably spontaneous and subject to alternating fits of considerable self-pity and self-delusion. Athanassiadi traces the Emperor Julian’s responses to personal and public challenges, and dwells on the conflicts that each weighty choice imposed on him. This analysis of Julian’s character and of all the issues that confronted him as an emperor, intellectual and mystic is based largely on contemporary evidence, with particular emphasis on the extensive writings of the man himself. INTRODUCTION : HELLENISM: UNITY OR DIVERSITY?